One - Click is all you need! 1.) Holds and slices butter with a squeeze. 2.) Safe for children to use. Slices can be cut and dispensed with one or two hands. 3.) Uses less refrigerator shelf space and replaces the ever-greasy butter dish. 4.) Keeps hands and butter clean. 5.) Seldom needs washing but is dishwasher safe. 6.) It’s fully guaranteed for one year but will last for many years. 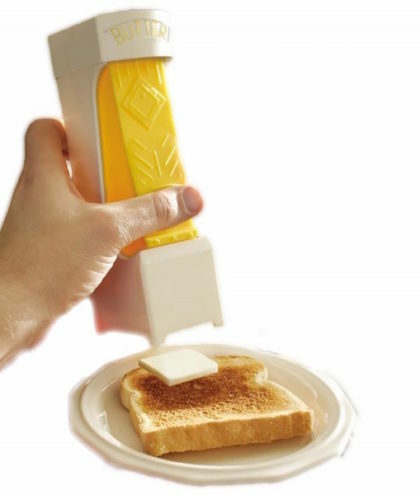 The Original Butter Cutter fits standard 1/4 lb. bars that are about 5" long. 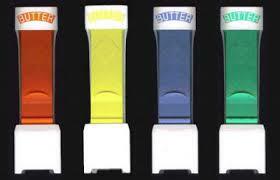 If you live in California, Oregon, or Washington State, please order the Multi-Size Butter Cutter. Shipping is $2.99 for any quantity of Butter Cutters.